The Smiler is closed to the public today after not making it all the way around the track. The incident occurred during the routine morning testing and no staff members or visitors were on the ride at the time. The ride car came to rest in the middle of the "batwing", a set of inversions in the first half of the ride. The X-Sector was closed this morning as removal of the train will require a crane to be brought in. This sort of incident is not unheard of - the Corkscrew used to require passengers during testing because otherwise it could sometimes stall, and once famously stopped in the middle of the corkscrews with members of the public on board. It is however unusual for a modern ride to experience these issues. Although the safety of guests or staff was never at risk, the incident only adds to the myriad of problems that The Smiler has faced during the lead-up to opening. 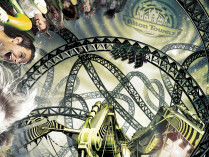 Alton Towers have stated on their Twitter feed that they hope to get The Smiler back in operation tomorrow.